Swiss / Lufthansa cheap return flights from France to Rio de Janeiro €353! Good opportunity for travelers in France to book fairly priced return flights from Nice, Paris, Marseille, Bordeaux, Toulouse, Strasbourg or Lyon to Rio de Janeiro also next winter season 2019/2020 which is considered as main tiourist season in this part of Brazil. Return flights based on a Star Alliance carriers Swiss Air Lines and Lufthansa with one short layover in Zurich / Frankfurt on your way are available from €353. Fare is for a round trip ticket and inclusive of all taxes, in-flight meals and checked bag. Looking for a budget option from Europe to South America on a classic European carriers this is perfect solution for you.. If interested in this discount deal with Lufthansa and Swiss you will find the cheapest flights when departing from France to Rio de Janeiro from April to June or September 2019 to March 2020. Min stay 4 days. Max stay 3 months. No free stopover available. Including 23kg bag in hold. Fare class is “K – Discount Economy – 25% to Miles & More loyalty programme“. Swiss / Lufthansa promo sale is running till 24th of April or until sold out..
We recommend you firstly compare the cheapest flights via Google Flights (Guide). The tool gives you almost instant result and you can easily browse throughout all the months. You can then book this deal directly with Swiss / Lufthansa or your preferred booking agent. If interested in this offer you can refer to our booking samples below. Rio de Janeiro is the second largest city in Brazil, on the South Atlantic coast. Rio is famous for its breathtaking landscape, its laid back beach culture and its annual carnival. The harbour of Rio de Janeiro is comprised of a unique entry from the ocean that makes it appear to be the mouth of a river. Additionally, the harbor is surrounded by spectacular geographic features including Sugar Loaf mountain at 395 meters (1,296 feet), Corcovado Peak at 704 meters (2,310 feet), and the hills of Tijuca at 1,021 meters (3,350 feet). These features work together to collectively make the harbor one of the Seven Natural Wonders of the World. If you will book these Swiss / Lufthansa flights from France to Rio de Janeiro you can read more about this city at Wikitravel. 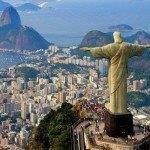 Booking sample of promotional deals on Swiss / Lufthansa cheap return flights from France to Rio de Janeiro from €353! As per above booking sample your outbound flight from Bordeaux to Brazil would be on 15th of November. You would return from South America back to Europe on 29th of November 2019.